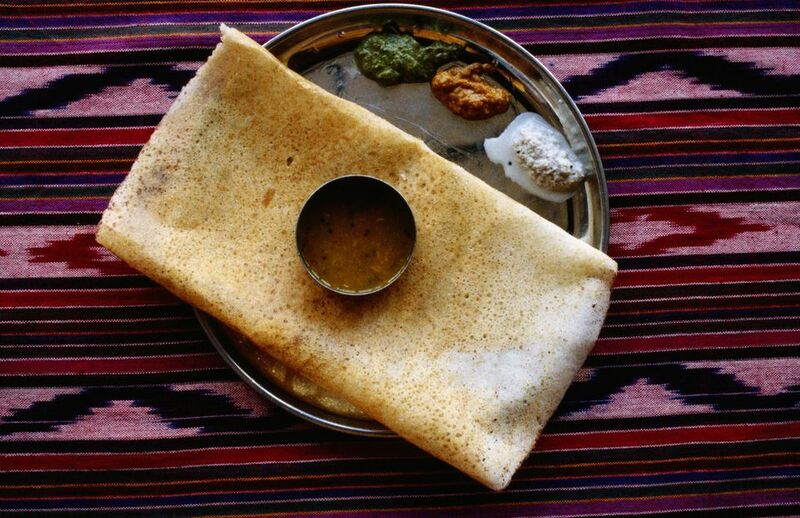 Dosas are crispy, savory pancakes from South India. They are a staple food in that region, but are popular in the rest of the country, too. The pancake is similar in appearance to a crepe but is made with a fermented batter of rice, urad daal, and fenugreek seeds. After spooning some batter into a skillet, it is spread in a circular motion until it fills the pan; it is drizzled with oil, cooked on one side, and then flipped and cooked for another minute. It is then folded in half and cooked a bit more before serving with chutneys. To make dosas, you will need dosa batter, which calls for rice, urad daal, fenugreek seeds, salt, and cooking oil. You should also have on hand a bowl of cooking oil, a bowl of ice cold water, a large, flat nonstick pan, and a paper towel, as well as a ladle, spatula, and basting brush. To add the right amount of oil to the pan, it is easiest to use a paper towel. Fold one sheet of paper towel into a wad and dip it lightly into the bowl of cooking oil. Squeeze out any excess and then rub the paper towel all over the surface of the pan to grease. You know you have the correct amount of oil when it is barely visible on the pan. Place the pan on the stovetop and turn the heat to medium-high. Once the oiled pan is hot, fill the ladle 3/4 full with dosa batter. Gently pour this batter into the center of the pan—just as you would for a pancake—until the ladle is empty. The goal is to have the batter spread toward the edges of the pan. In sweeping circular motions, spread the batter to form a pancake roughly 8 inches in diameter. You can use the back of the ladle for this, or a rubber spatula. 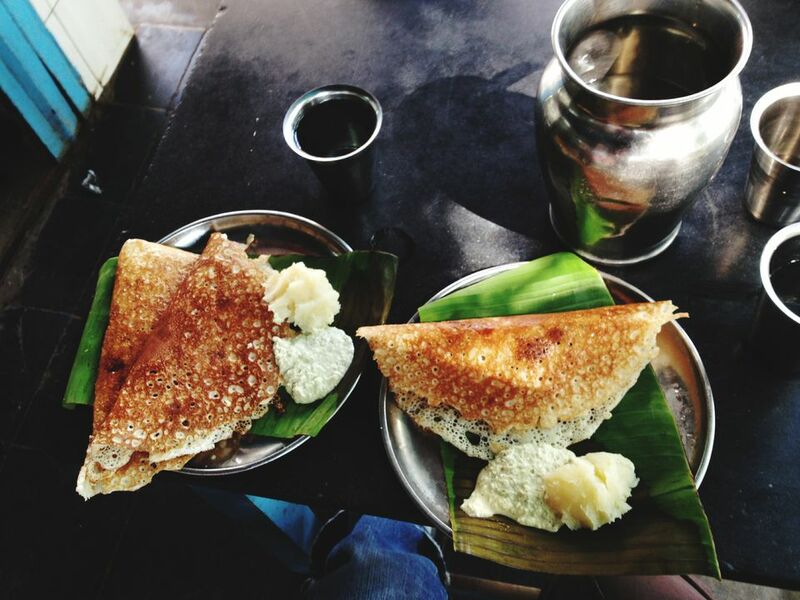 Do not be alarmed if the dosa develops tiny holes as you spread the batter; this is normal. As soon as you have finished spreading the batter out on the pan, dip the basting brush in cooking oil and drizzle the oil all over the surface of the dosa and also around its edges. Now holding the pan by its handle, lift it up and swirl it so as to make the drizzled oil spread all over the pancake. When the upper surface begins to look cooked, meaning it no longer looks soft or runny, flip over the dosa. Ideally, the surface that was touching the pan should be light golden in color. Allow the pancake to cook for 1 minute after flipping. The dosa is now almost done. The final step is to fold it in half and allow it to cook for 30 seconds more. Use a spatula to fold one side of the pancake over the other. Before you start making the next dosa, fold another sheet of paper towel into a wad and dip it in ice cold water. Squeeze the wad to remove excess water and then rub it all over the surface of the pan to cool it slightly. This ensures your next dosa will spread evenly and not break because the pan is too hot. Now proceed as you did for the last dosa. Serve the dosa with side dishes like South Indian coconut chutney, South Indian gunpowder chutney, and sambar. Dosas are best served immediately so they are crisp and fresh when eaten, but you can also make, stack, and serve the dosas later. Just ensure you keep them warm until serving time by placing them in a covered dish.